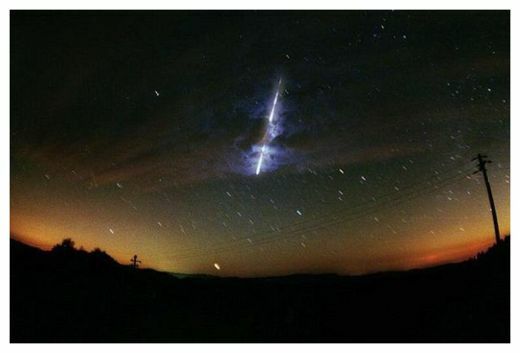 US: Rainbow-Colored, Exploding Meteor Appears Just South of D.C.
A Leonid fireball during a Nov. 1998 meteor shower in Italy. Hordes of incandescent meteors have ripped across U.S. skies this past week. According to alert skywatchers, the nation's capital got in on the stellar action in a big way. No discernible sound. Very bright, same as the moon. Not blinding, but quite noticeable. Not sure, [but it looked like it had] only one tail. I'm not sure if it was when it entered the atmosphere, but I saw almost an explosion or halo form around it about halfway through its travel before it disappeared. A meteor that was hoisted with its own petard, you say? Go on! Two seconds left to right. White, reddish. Brightest thing in the sky.... I thought it was a falling star but then it exploded with a bright flash of light. It look like it hit something and disintegrated. There was a big puff of what look like smoke. The forums of the American Meteor Society bear no similar reports of a Monday-night fireball near D.C., but resident site expert Robert Lunsford notes a number of minor meteor showers that might account for the sparking skies. The Andromedid shower is still ongoing with "low, but detectable" and slow-moving meteors, and the November Orionids reached their anthill peak on Nov. 30. A dimmed, crescent moon is allowing amateur astronomers in the Northern Hemisphere to see as many as four shooting stars an hour, Lunsford says. So keep your eyes open and you might just see one of these eerie travelers from the beyond. However, best know how to distinguish between a meteor and a helicopter, first. A piece of metal crashed through the roof of a Plymouth business. Plymouth - A solid piece of metal crashed through the roof of a Plymouth furniture warehouse on Thursday. Investigators say the debris appears to have fallen from the sky, but it did not come from a plane. Michael Facchini, the owner of Michael's Wholesale Furniture Distributors found the 3-5 lb. chunk of debris on the floor of his building off Camelot Drive. Facchini also discovered a hole in the roof of the building. "Looked up, the ceiling had a big hole," he told WBZ-TV's Kathy Curran. "One of the workers came by and noticed the office was a mess and asked if I knew what happened then I looked and saw metal and figured it came from high above." No one was hurt by the falling debris. The FAA has sent an inspector to Plymouth to help investigators. A hole can be seen through the roof of a Plymouth business after a mystery object crashed through. They are now tasked with trying to figure out where the metal came from. Officials originally suspected that it could have fallen off of a passing plane, but they have since ruled out that possibility. "We have no idea what it is. At this point, we can only speculate. No clue," said Plymouth police Capt. John Rogers. "This would have had to come through with some significant force or velocity to get through the warehouse roof and cause damage." At Michael's Wholesale Furniture Distributors, the fact no one was hurt has employees counting their lucky stars. In fact, they say they're going to play the lottery tonight after surviving this strange event. SOHO's 16th Birthday gift is on it's way, and the tracking number states delivery by midnight on December 15th! 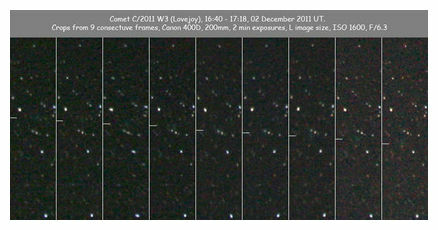 On December 2nd, 2011, newly discovered Kreutz-group comet C/2011 W3 (Lovejoy) was announced. SOHO discovers these objects on average every three days, but this one is different... it was found from a ground based telescope, and marks the first such discovery in over 40yrs. It also marks a significant achievement for Australian astronomer Terry Lovejoy, who as an early pioneer of discovering SOHO comets over the internet, can now claim to be the first person to discover a Sungrazer from both ground and space-based telescopes! Traditionally, and with little exception, ground-discovered Kreutz-group comets have gotten bright. Very bright! In 1965, Kreutz-comet Ikeya-Seki was so bright, it could be seen by the naked eye by blocking the Sun out with your hand. We do not expect C/2011 W3 to get this bright, so reserve your seat next to your computer and stay tuned to the SOHO, STEREO and Sungrazer websites as we prepare for this rare and potentially spectacular object to enter our cameras around Dec 12, meeting its fiery demise late on Dec 15. We will have more information on this site over the coming week. In the meantime, updates will occasionally be posted at the Sungrazer site. China's Xinhua News Agency reported a golden UFO appeared in the northwestern sky and was seen by some citizens in Beijing, Tianjin and Hebei on the evening of Nov 30. Astronomers said it was a super fireball that is rarely seen. Ma Qiang is an amateur astronomer living in Tianjin who witnessed the flying fireball. He said the fireball glittered and flew from northwest to the west around 5:25 pm and disappeared after two seconds. Its golden lights were brighter than the moon. Some citizens in Beijing also saw the fireball and reported the incident. 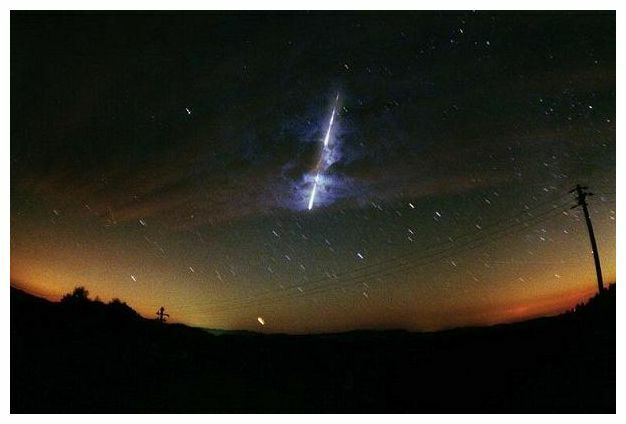 Director of Beijing Planetarium Zhu Jin said the glittering object is a super bright fireball that is rarely seen, according to descriptions given by the witnesses. Astronomers say a fireball is a kind of meteor that has seldom been observed. Flying in the aerosphere, the fireball sometimes sounds like a pen scratching on paper. It is brighter than Venus at night. 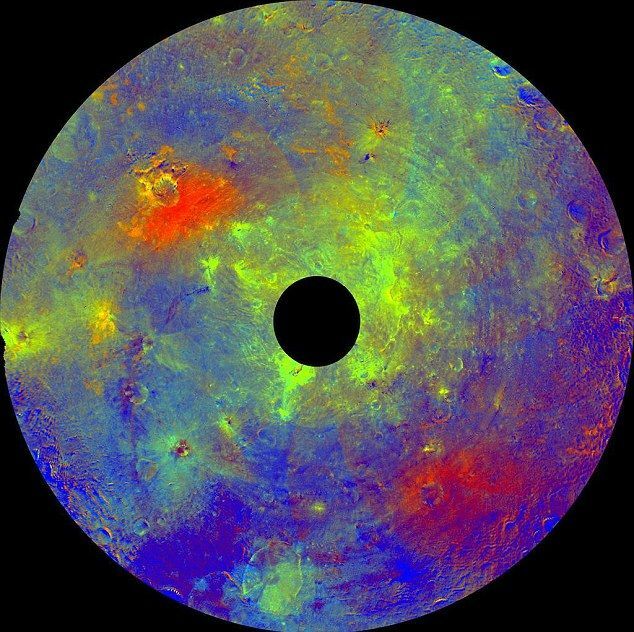 Vesta is the second-largest object in the asteroid belt - 320 miles across - and is being probed by a hi-tech robot 'surveyor' that will then move on to its bigger 'sister' asteroid Ceres. New views sent back by the probe, Dawn, this week, reveal an object more like a planet than an asteroid - and scientists say they now consider it a 'transitional body' between the two. The Dawn spacecraft has been beaming back images since July - the latest show a rugged surface is unique compared to the solar system's much smaller and lightweight asteroids. 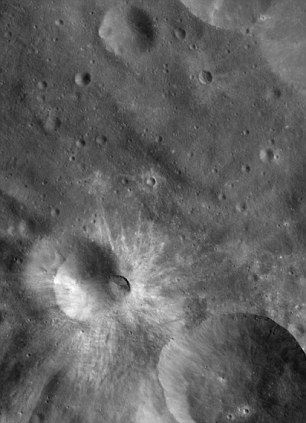 Impact craters dot Vesta's surface along with grooves, troughs and a variety of minerals. 'Vesta is unlike any other asteroid,' said mission co-scientist Vishnu Reddy of the Max Planck Institute for Solar System Research in Germany. The new findings were presented at a meeting of the American Geophysical Union in San Francisco. This image using color data obtained by the framing camera aboard NASA's Dawn spacecraft shows Vesta's southern hemisphere in color, centered on the Rheasilvia formation - the different colours reflect different minerals in the surface. Rheasilvia is an impact basin measured at about 290 miles (467 kilometers) in diameter with a central mound reaching about 14 miles (23 kilometers) high. The black hole in the middle is data that have been omitted due to the angle between the sun, Vesta and the spacecraft. Most asteroids resemble potatoes, but Vesta is more like an avocado with its iron core, Reddy said. Asteroids are remnants from the birth of the solar system some 4.5 billion years ago around the same time as the formation of the rocky planets including Earth. Studying asteroids can offer clues about how our planetary system began. Instead of returning to the moon, NASA has decided to land astronauts on a yet-to-be determined asteroid as a stepping stone to Mars. David Williams of Arizona State University considers Vesta a 'transitional body' between rocky planets and the thousands of asteroids floating between Mars and Jupiter. The mission has yielded a mystery. 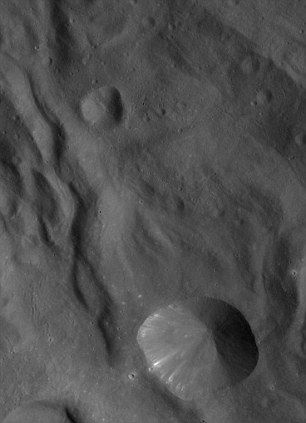 Before Dawn arrived at Vesta, scientists predicted that the surface would harbor a volcano. There's a hill on Vesta, but researchers said there's no evidence of lava flow or volcanic deposits. Williams said it's possible the volcanic materials are buried, so the team will keep looking. Powered by ion propulsion instead of conventional rocket fuel, Dawn will study Vesta for several more months before cruising to an even bigger asteroid, Ceres, where it will arrive in 2015. Not very many of these lately. I personally think it was a meteor or space junk burning up in the atmosphere, FYI. "The Moon looks full in the video, but it was not full last night!" That's just a trick of the camera. Think of it as a light bulb -- if you take a picture of a dimly lit room with a visible light bulb, the room will be exposed normally, while the light bulb will be overexposed. If the camera measured exposure on the light bulb, the room would be completely dark, while the light bulb is properly exposed. The same thing happens with the moon -- it works just like the light bulb at night and it will always be overexposed. These are the orbits of five objects that hit Earth on the night of Dec. 7/8. NASA's All Sky Fireball Network recorded the meteoroids as they disintegrated in the atmosphere over the United States, each one producing a bright fireball. Note how all the orbits converge on a single point--our planet. Every night the network's cameras scan the skies over the United States, forming an inventory of what hits the atmosphere. Combining images from multiple cameras, network software rapidly calculates the basic parameters of each interloper: orbit, speed, disintegration height, and more. At the moment, cameras are located in only four states (New Mexico, Alabama, Georgia, Tennessee), but the network is expanding to provide even better coverage. Soon we'll see just how congested our intersection in space really is. 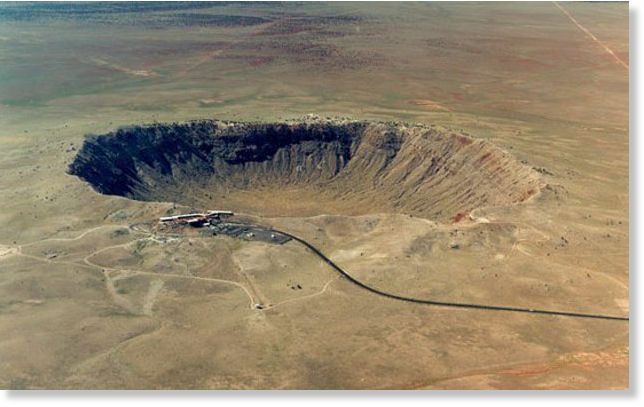 Picture shows an aerial view of Meteor Crater, near Winslow, Ariz. The Barringer meteorite crater - known popularly as "Meteor Crater" - near Winslow, Ariz., was formed some 50,000 years ago in the flat-lying sedimentary rocks of the Southern Colorado Plateau in Arizona. Now, scientists are using the crater to study mysteries near and far. This out-of-the-blue geological feature is considered a prime example of a young, well-preserved and well-documented simple impact crater. That means it represents one of the most common morphological features on planetary surfaces, both on Earth, and elsewhere in our solar system. Scientists are using this crater to probe not just our own planetary history, but the mechanics of space rock impacts throughout the universe. Meteor Crater is one of very few impact sites on our planet where the geologic details of crater excavation and ejecta emplacement are preserved. While the outline of most simple craters is circular, the shape of Arizona's Meteor Crater strongly deviates from a circle and resembles a quadrangle. The bowl-shape crater is surprisingly well preserved by terrestrial standards. That makes it a "kiss and tell" terrestrial feature that is being plumbed by researchers far and wide. The crater is roughly 0.75 miles (1.2 kilometers) in diameter. That giant hole in the ground sports a rim that rises up to 196 feet (60 meters) above the surrounding landscape. The crater floor falls to a depth of 590 feet (180 meters). The upper crater walls have average slopes of 40 to 50 degrees, although they also include vertical to near-vertical cliffs. The rock ejected from the crater forms a debris blanket that slopes away from the crater rim out to a distance of 0.6 miles (1 km). This impact crater is viewed as a treasured scientific site, not only here on Earth but in shaping future moon and Mars exploration plans. It has become a training ground for astronauts and robot hardware as well as a learning lab for planetary geologists who are investigating impact cratered terrains on other planets. Indeed, it's a "hole Earth catalog" of processes that keeps on giving. When a cosmic interloper slammed into Earth tens of thousands of years ago, more than 175 million metric tons of rock were excavated and deposited on the crater rim and the surrounding terrain in a matter of a few seconds, said David Kring, a senior staff scientist and geologist at the Lunar and Planetary Institute in Houston. Kring has been engaged in studies of the crater for decades. He uses the site as a teaching tool for students, as well as a locale for honing the exploration skills to lunge beyond Earth. "Those rocks and the processes they record remain the focus of our studies next year," Kring told SPACE.com. "At the same time, we will conduct training activities that are designed to enhance the success of exploration of the moon and planetary surfaces throughout the solar system." There are a lot of activities at the crater, Kring said. He made two trips there in October alone, he added. First of all, the crater is being used to instruct postdoctoral researchers in the field of lunar science, as well as educate graduate students who are studying impact craters on the moon, Mars, and elsewhere. Furthermore, Kring added, Meteor Crater is being used to tutor astronauts for planetary surface operations, which require different talents than those needed for past space shuttle flights and work on the International Space Station. In terms of active research, the crater is telling the story of how material is ejected and deposited after a space rock impact. Its revelations have implications for craters on all planetary surfaces. Moreover, research at the site is being conducted to determine how water produces gullies and otherwise erodes the crater. This could help scientists interpret observations of Mars. Research is also being conducted at Meteor Crater, Kring said, to refine the age of the impact event itself. This work will help calibrate isotopic systems to date geologic events that occur elsewhere in the world. Lastly, the crater is providing an on-the-spot opportunity for evaluating the design of traverses and geologic station activities on the moon, Mars and other exploration destinations. There are still many open scientific questions about the crater itself. Kring said that an important remaining problem is that the trajectory of the impacting iron asteroid and the damage it caused to Earth's crust beneath the crater floor remain a mystery. "Both might be solved with a shallow drilling campaign," Kring said. Overall, there is still much work to do, Kring said. "As we push farther into the solar system, new questions are constantly being developed and require an assessment of new ideas at the world's best preserved impact crater," he said. "Thus, the crater is important for what it can tell us now, but is also important for what it will tell us as we continue to explore beyond low-Earth orbit." According to Brad Andes, president of Meteor Crater Enterprises, Inc., this year the crater attracted roughly 225,000 visitors. "We are excited about the fact that Meteor Crater has had a very important role as a science research laboratory in the past, but what is even more exciting is that almost every year, researchers request a visit to the crater because of a 'new' question that has been asked," Andes told SPACE.com. "And the answer to that question may live in the crater. This has been happening for decades. I am sure it will continue to happen for many more decades and possibly even centuries." There's also potential research at Meteor Crater investigating historical weather events. That information could even have a voice in the global warming debate, Andes said. "It is humbling to consider the fact that every day researchers get to work at a place that may be viewed as the Rosetta Stone for astrogeological research," he said. "This clearly illustrates the need to preserve it to the greatest degree possible while allowing legitimate research to happen here." A newly discovered comet is racing toward a mid-December rendezvous with the sun - a rendezvous that it will likely not survive. The comet is categorized by astronomers as a "sungrazer" and it is destined to do just that; literally graze the surface of the sun (called the photosphere) and pass through the sun's intensely hot corona, where temperatures have been measured at upwards of 3.6-million degrees Fahrenheit (2-million degrees Celsius). While the comet will not collide with the sun, most astronomers say the odds are rather long that it will remain intact after its closest pass by the sun. The most exciting aspect of the event is that the comet's expected destruction should be visible on your computer monitor. And there is a very slight chance that, should the comet somehow manage to survive, it might briefly become visible in broad daylight. The comet was discovered by Australian amateur astronomer Terry Lovejoy Nov. 27 using a C8 Schmidt-Cassegrain telescope, working with a QHY9 CCD camera. At first, Lovejoy believed that the rapidly moving fuzzy image he saw was nothing more than a camera reflection. But two nights later, despite clouds and haze, he managed to find the fuzzy object again and take several new images. Lovejoy then put out a call to some trusted observers to confirm his observations. He received that confirmation Dec. 1 from Mount John Observatory, based in the Mackenzie Basin on the South Island of New Zealand. By then, 31 separate observations of the comet had been collected to determine an orbit, and the first announcement of Lovejoy's discovery was made this past Friday (Dec. 2) by the Minor Planet Center of the International Astronomical Union. Its official title is C/2011 W3 (Lovejoy). It is Terry Lovejoy's third comet discovery. Astronomer Gareth V. Williams computed a preliminary orbit for the comet, which indicates that perihelion (closest approach to the sun) will occur at 7 p.m. EST Dec. 15 (00:00 GMT on Dec. 16) at a distance of 548,000 miles (882,000 km) from the center of the sun, meaning that the comet will skim a mere 115,000 miles (186,000 km) above the solar surface, putting it into the special classification of a "Kreutz Sungrazer." "I'm still quite stunned by the fact that W3 is a Kreutz Sungrazing comet," Lovejoy said. 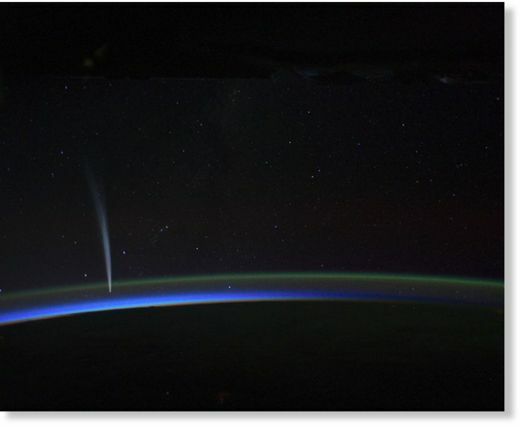 "This is a very special discovery to me as I have long been fascinated by the Kreutz Sungrazing comets; it has been over four years since my last discovery and I do hope the next one comes a lot sooner!" Lovejoy's discovery is rather special since it marks the first time that a Kreutz Sungrazer has been discovered from a ground-based telescope in over 40 years. Usually, such comets are discovered only within a few days of their closest approach to the sun, from satellite imagery. In the year 1888, astronomer Heinrich Kreutz (1854-1907) noted that sungrazing comets all followed along approximately the same orbit. Astronomers now think they were once all bits of a single giant comet that fragmented in the distant past. And it's quite probable that these fragments have themselves broken up repeatedly as they've orbited the sun, resulting in different comets at periods ranging from about 500 to 800 years. In honor of Kreutz's work, this special group of comets is named the Kreutz Sungrazers. Two of these sungrazers (seen in 1843 and 1882) not only developed very long tails but also achieved the rare distinction of having been bright enough to be seen in broad daylight with the unaided eye. And the brightest comet of the 20th century appeared in the autumn of 1965: Comet Ikeya-Seki. On Oct. 21, 1965, many could easily view this comet with the naked eye if the sun was hidden behind the side of a house or just an outstretched hand. In Japan the comet was described as appearing about 10 times brighter than the full moon. 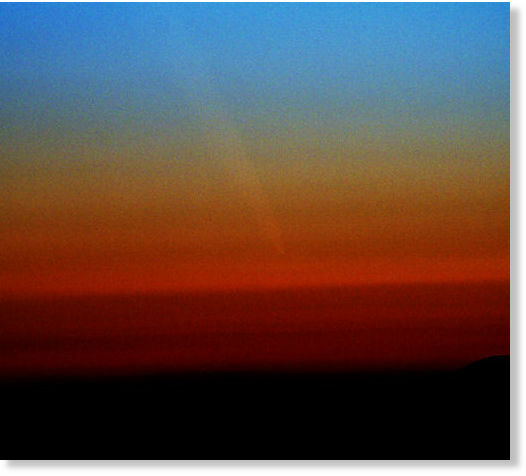 Until 1978, only about a dozen sungrazing comets had been positively identified. Beginning in 1979, orbiting space observatories began to detect sungrazing comets using instruments called coronagraphs. A coronagraph is designed to look at the solar atmosphere by blocking out the bright disk of the sun. 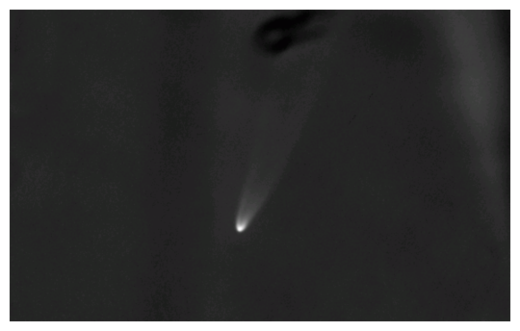 Tiny sungrazing comets, which normally would be too faint and too near to the glare of the sun, can be picked up using a coronagraph. In fact, sungrazers are now routinely being discovered using the Large Angle Spectrometric Coronagraph on the Solar and Heliospheric Observatory (SOHO) satellite. In fact, SOHO is the most successful comet discoverer in history, having found 2,110 comets over 16 years of operation - an average of one about every three days. What's even more impressive is that the majority of these comets have been found by amateur astronomers and enthusiasts from all over the world, scouring the SOHO images for likely comet candidates from the comfort of their own homes. Absolutely anyone can join this project - all you need is an Internet connection and some free time. If you want to join the hunt, go to here. Some of these are probably just a few meters across; none have survived their sweep around the sun. In a way, Kreutz comets are like trains of all sizes moving along the same railroad track while passing our station (Earth) in space. And like impatient commuters, we can only watch and wonder what awaits us up the track. As we noted earlier, literally thousands of sungrazers have flicked past the sun as tiny objects briefly visible via satellite imagery. Some Kreutz comets are very bright and spectacular. Given that at least 10 have reached naked-eye visibility over the last 200 years, another could be just around the corner. The last Kreutz Sungrazer to become bright was Comet White-Ortiz-Bolelli in May 1970. Before that was the dazzling Comet Ikeya-Seki in 1965. Since Comet Lovejoy is the first sungrazer in over-40 years to be discovered en route to the sun with an Earth-based telescope, one might wonder if it will evolve into a memorable spectacle. Unfortunately, while Lovejoy is probably many times larger than the vast majority of the Kreutz Sungrazers that sweep to their ultimate solar demise, it is likely many times smaller than the spectacular Kreutz comets of the past. In fact, when at the same distance from the sun that Comet Lovejoy is now, Comet Ikeya-Seki appeared over-1,000-times brighter. Ikeya-Seki and the nine other naked-eye sungrazers that have appeared over the last two centuries managed to survive their close shaves with the sun because they were physically large as well as moving with tremendous speed. Indeed, at perihelion, sungrazing comets literally describe a hairpin turn around the sun at over-a-million miles per hour. But even those larger Kreutz specimens sometimes emerge from their solar meetings in shambles. The nucleus of Ikeya-Seki fractured into at least three pieces; the Great Comet of 1882 may have broken into six or eight pieces. 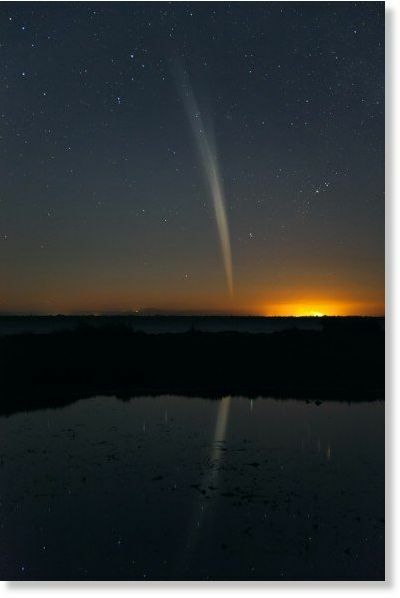 According to John Bortle of Stormville, N.Y., who has observed several hundred comets in his more-than-50 years as an assiduous amateur astronomer, Comet Lovejoy, "appears to be only modestly condensed, at best, and lacking in any obvious stellar nucleus, even a very faint one. In my mind this does not bode particularly well for this diminutive object. If it already may be seriously depleted in its meager reserves of volatiles, how much will be left available for its final death plunge into the solar corona?" Bortle adds that another comet (du Toit in 1945) reportedly exhibited a similar physical appearance to Comet Lovejoy en route to the sun and was of a similar brightness. Ultimately, du Toit totally faded away before ever reaching the sun. Is this Comet Lovejoy's future? "I hope not, but I really have to wonder," Bortle said. Death of a comet . . . on your computer! To get a good view of Comet Lovejoy, reserve a seat next to your computer and stay tuned to the SOHO website. Comet Lovejoy (if it hasn't faded completely away) is expected to enter camera range beginning next Monday (Dec. 12), appearing to move rapidly up from the south, then rapidly curve up and around the sun in what may prove to be a fiery demise Dec. 16. There is also the ever-so-slight chance that this comet might briefly become visible in broad daylight around that time as well. But that's only assuming the comet somehow survives its close brush with the sun, which doesn't look very likely. Then again, you never know. There are still no answers as to what caused an apparent explosion in Perry County Sunday night. Crews spent hours searching Sunday night after initial reports of a possible plane crash, but they gave up the search around 1:00 a.m. and said it was probably an explosion at an abandoned mine. Now officials with the Division of Abandoned Mine Lands are saying there is no evidence at the mine that would support an explosion. Some say they felt their homes shaking, others say they saw a fireball, but as of now no one can say for sure what happened in Perry County Sunday night. Preliminary reports of possible plane crash were ruled out after searching for hours and finding no crash scene, that led officials to this explanation. "There is a mine break up there. It happens in eastern Kentucky with a lot with old abandoned mines. They catch fire, smoke real bad, and sometimes they flame up. It does kill the trees around and that is possibly what could be seen from the air," said Lotts Creek Fire Chief Chris Engle. Officials from the Division of Abandoned Mine Lands were called Monday to investigate and found that there is a coal seam fire that is causing the smoke and the burned trees, but that's all they are able to confirm. "My investigators found no evidence of an explosion or a fire ball. There was no crater no debris that they could ascertain," said the Director of the Division of Abandoned Mine Lands Steve Hohmann. So until more information can be found, that leaves no explanation for the shaking houses and what appeared to be a fireball in the sky, but some in the area have their own explanation for what happened. "If there is no plane missing I think it probably could be a U.F.O. If there is no debris, it probably burned before it hit the ground," said Perry County resident Kathy Collins. For now, it remains a mystery. Officials with the Division of Abandoned Mine Lands say they are planning to go back up to the mine site on Wednesday. A comet nearly as wide as two football fields (200m) is plunging toward the sun where it will most likely be destroyed in a spectacular light show on Dec. 15/16. Although Comet Lovejoy (C/2011 W3) could become as bright as Jupiter or Venus when it "flames out," the glare of the sun will hide the event from human eyes. Solar observatories in space, however, will have a grand view. Yesterday the brightening comet entered the field of view of NASA's STEREO-B spacecraft. "You can clearly see the comet heading diagonally through the images," says Karl Battams of the Naval Research Lab who prepared the animation. "During the 16-hour sequence, the comet brightens from magnitude +8 to +6.5, approximately." It will soon grow much brighter. "This comet is a true sungrazer, and will skim approximately 140,000 km (1.2 solar radii) above the solar surface on Dec. 15/16," notes Battams. At such close range, solar heating will almost certainly destroy the icy interloper,creating a cloud of vapor and comet dust that will reflect lots of sunlight. The Solar and Heliospheric Observatory (SOHO) will have a particularly good view. Discovered on Dec. 2nd by amateur astronomer Terry Lovejoy of Australia, the comet is an unusually large member of the Kreutz family. Kreutz sungrazers are fragments of a single giant comet (probably the Great Comet of 1106) that broke apart back in the 12th century. SOHO sees one plunging into the sun every few days, but most are small, no more than 10 meters wide. Comet Lovejoy is at least ten times larger than usual. The huge fireball event as seen from a remote camera in Orangeville, Ontario. In newly released footage from the University of Western Ontario, a bright, slow-moving fireball was captured in the skies near Toronto, Canada on December 12, 2011 by remote cameras watching for meteors. Although this meteor looks huge as it burns up in Earth's atmosphere, astronomers estimate the rock to have been no bigger than a basketball. Footage reveals it entered the atmosphere at a shallow angle of 25 degrees, moving about 14 km per second. It first became visible over Lake Erie then moved toward the north-northeast. But in a meteorite-hunter alert, Peter Brown, the Director of Western's Centre for Planetary & Space Exploration said that data garnered from the remote cameras suggest that surviving fragments of the rock are likely, with a mass that may total as much as a few kilograms, likely in the form of many fragments in one gram to hundreds of a gram size range. "Finding a meteorite from a fireball captured by video is equivalent to a planetary sample return mission," said Brown. "We know where the object comes from in our solar system and can study it in the lab. Only about a dozen previous meteorite falls have had their orbits measured by cameras so each new event adds significantly to our understanding of the small bodies in the solar system. In essence, each new recovered meteorite is adding to our understanding of the formation and evolution of our own solar system." Brown and his team are interested in hearing from anyone who may have witnessed or recorded this event, or who may have found fragments of the freshly fallen meteorite. See UWO's website for contact information. Western Meteor Group's Southern Ontario Meteor Network sensor suite has seven all-sky video systems designed to automatically detect bright fireballs. 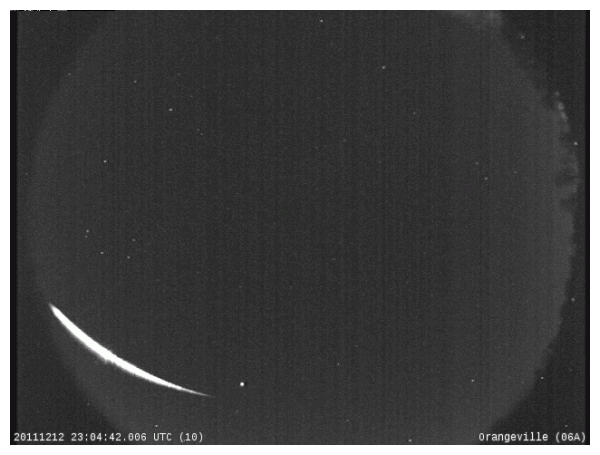 At 6:04 p.m. on December 12, six of the seven cameras of Western's Southern Ontario Meteor Network recorded this meteor. 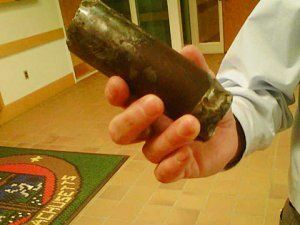 In a press release, UWO said the fireball's burned out at an altitude of 31 km just south of the town of Selwyn, Ontario. It is likely to have dropped small meteorites in a region to the east of Selwyn near the eastern end of Upper Stony Lake. See the map of the projected path below. 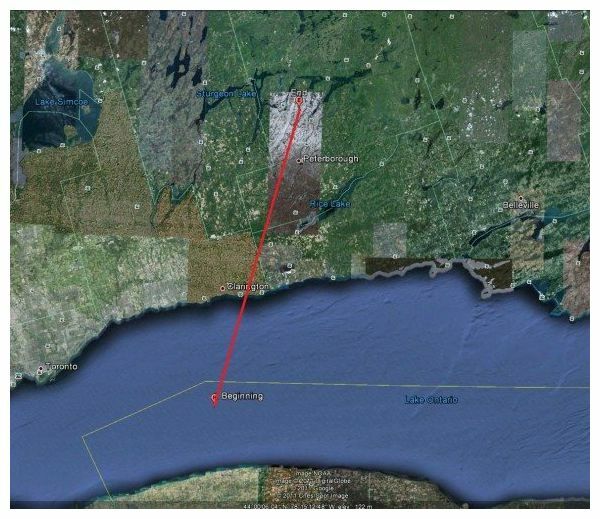 Estimated flight path of the Dec. 12, 2011 meteor seen near Toronto, Canada. Comet Lovejoy update - will it miss the sun? 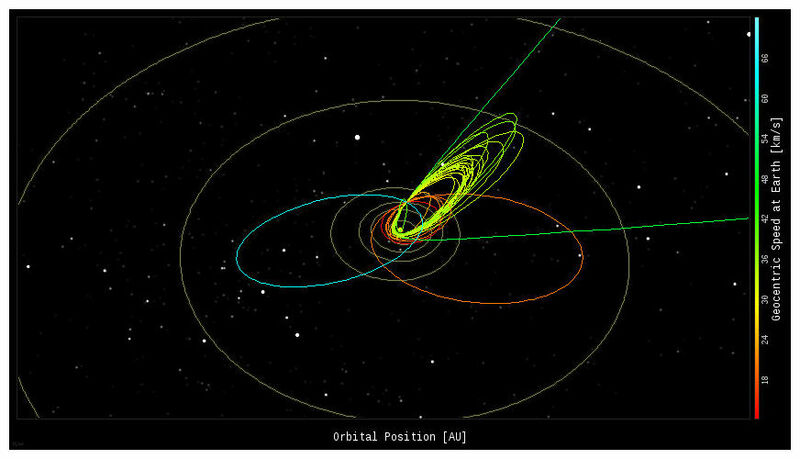 The clustered green orbits match the trajectory of near-Earth asteroid 3200 Phaethon, source of the annual Geminid meteor shower. The Geminids have been active this week as Earth passes through the asteroid's mysterious debris stream. 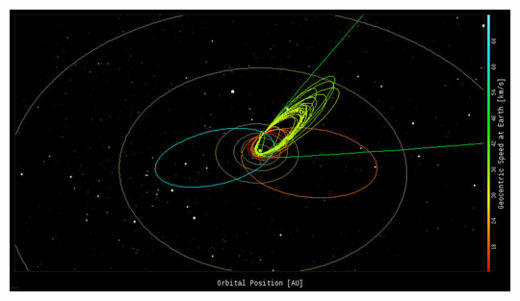 The other, non-Geminid orbits correspond to random meteoroids. Not belonging to any organized debris stream, random meteoroids litter the inner solar system and produce a daily drizzle of "sporadic" fireballs. NASA's fireball network, which connects multiple cameras in New Mexico, Alabama, Georgia and Tennessee, is a "smart" system. It rapidly and autonomously calculates meteoroid orbits from the fireballs it records. Another orbit diagram is just hours away; stay tuned. Comet Lovejoy Has a Friend! As nice as this is, I am not in the least surprised. SOHO's Kreutz-group comets are very "clumpy", for want of a better word. We frequently see them arrive in pairs or sometimes trios, and the big bright ones in particular will often have a companion comet. I suspected we would get at least one with Comet Lovejoy and indeed we do. It's much more typical of the size and brightness of Kreutz comets we see, and offers a wonderful comparison to highlight just how special Comet Lovejoy is. So what is this new comet called? Is it another "Comet Lovejoy"? Sadly not. It looks to me like it was actually spotted in the LASCO C3 images by seasoned comet hunter Zhijian Xu at Dec 14 2011 11:48:48. So will it be Comet Xu?? No again. It will be Comet SOHO, number 2190-something, I think. Oh, and notice how it's orbit is obviously slightly different from Lovejoy's? That's also something we see all the time; the companion comets are frequently in slightly different orbits. They are obviously closely related though and the smaller one must have fragmented from Lovejoy some significant time ago, and with some slight (non-gravitational) force between them to "push" them apart like this. These kinds of break-ups are theorized to happen decades before they reach the Sun in order for them to have this kind of separation in space, though this process is not well-known or well-understood at all. It one reason that studying these Kreutz comets is so important, as this knowledge can be applied to all comets and solar system bodies, and give a broader understanding of their orbital and physical evolution. SDO also recorded Comet Lovejoy's entry into the sun's atmosphere: movie. Comet Lovejoy began the week as a chunk of dusty, rocky ice some 200 meters in diameter. No one can say how much of the comet's core remains intact or how long it will hang together after the searing heat of perihelion. Curiously, the comet seems to have lost its tail in transit through the sun's hot corona. 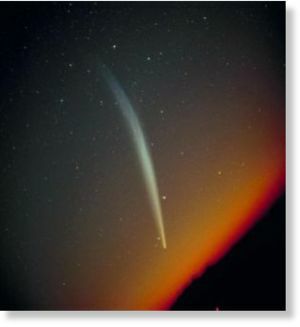 A decapitated remnant tail can still be seen tracing Comet Lovejoy's path into the sun, but the exiting comet has no obvious trail of dust behind it. One possibility has to do with geometry: The comet's tail might be pointing away from Earth, temporarily invisible due to foreshortening. Another possibility: The comet's store of volatile materials was "baked-out" by the fiery transit and now the comet is not jetting much dust and gas into space. The scorched core of sungrazing Comet Lovejoy is still intact as it recedes from the sun. Even the comet's flamboyant tail, temporarily lost in transit through the solar corona, has regrown. Click here to view the last 24 hours of coronagraph images from the Solar and Heliospheric Observatory (SOHO). SOHO images show two tails: the ion tail and the dust tail. The ion tail is made of gas and is blown directly away from the sun by the solar wind. The heavier dust tail is curved and more closely traces the comet's orbit. 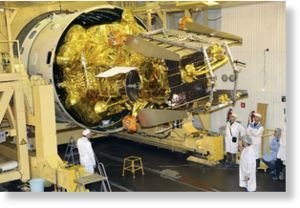 In this Nov.2, 2011 file photo distributed by Russian Roscosmos space agency shows technicians working on the Phobos-Ground probe. A Russian spacecraft bound for a moon of Mars and stuck in Earth's orbit will come crashing back next month, but its toxic fuel and radioactive material on board will pose no danger of contamination, the Russian space agency said Friday. Between 20 and 30 fragments of the probe with a total weight of up to 200 kilograms (440 pounds) will survive the fiery plunge and shower the Earth's surface, Roscosmos warned in a statement. As of now, it said only that the probe's fragments could rain down anywhere along a broad swath between 51.4 degrees north to 51.4 degrees south, which would include most of land surface. But Roscosmos said it is sure that all fuel will burn on re-entry some 100 kilometres (330,000 feet) above the ground and pose no danger. It said that 10 kilograms (22 pounds) of Cobalt-57, a radioactive metal contained in one of the craft's instruments, will not pose a threat of radioactive contamination. The Phobos-Ground was Russia's first interplanetary mission since a botched 1996 robotic mission to Mars, which failed when the probe crashed shortly after the launch due to an engine failure. Mars has two moons, Phobos and Deimos, and the latest spacecraft aimed to take ground samples on Phobos. It was one of the most challenging unmanned interplanetary mission ever. Scientists had hoped that studies of Phobos' surface could help solve the mystery of its origin and shed more light on the genesis of the solar system. Some believe the crater-dented moon is an asteroid captured by Mars' gravity, while others think it's a piece of debris from when Mars collided with another celestial object. 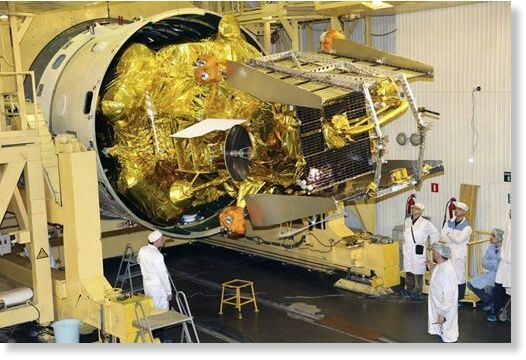 The failed mission was the latest in a series of recent Russian launch failures that have raised concerns about the condition of the country's space industries. Officials have blamed the failures on obsolete equipment and an aging workforce. Comment: SOTT wonders what is UP with all the recent alleged man-made space objects falling out of the sky? We've gone for years and years without this repeated showering of space-junk and now, all of a sudden, in just the past year, there have been at least three, and now four raining debris down on our heads? Is it possible that it is not really man-made and these explanations are being offered to cover up the fact that the planet is already being subjected to cometary fragment bombardment? Just asking. 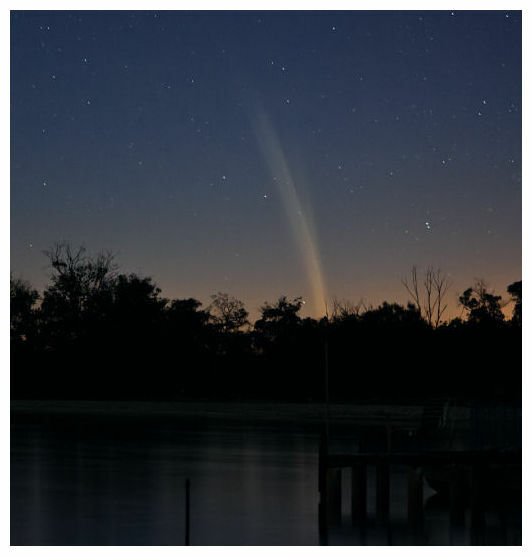 Noted astronomer John Bortle urges observers (especially in the southern hemisphere) to "begin searching for Comet Lovejoy's bright tail projecting up out of the morning twilight beginning at dawn. 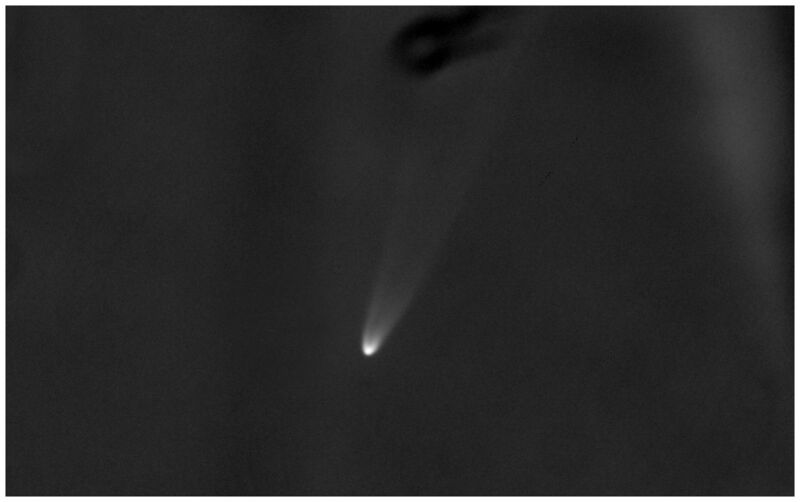 The tails of some of the major sungrazing comets have been extraordinarily bright. Comet Lovejoy's apparition has been so bizarre up to this point that it is difficult to anticipate just what might happen next ... [including] the exact sort of tail it might unfurl in the morning sky." Comet Lovejoy photographed remotely with the FRAM telescope in Argentina on Dec. 17 by a Czech team of Jakub Cerny, Jan Ebr, Martin Jelinek, Petr Kubanek, Michael Prouza and Michal Ringes. It was almost a pre-holiday miracle that Comet Lovejoy survived its close encounter with the Sun on Dec. 15, 2011. But now, the feisty comet is making a 'merry and bright' comeback, re-sprouting its tail and showing up brilliantly with binoculars and in telescopic images from southern hemisphere skywatchers. 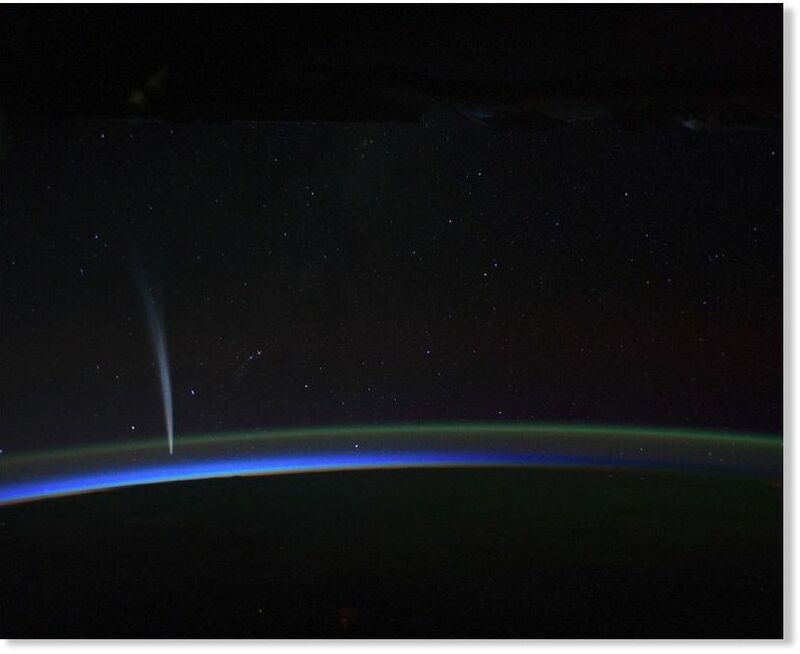 "It was a big surprise that after going through the solar atmosphere it re-emerged with a beautiful tail," Karl Battams told Universe Today. Battams is with Naval Research Laboratory and has been detailing the Comet Lovejoy's incredible journey on the Sungrazing Comets website. "And basically within a day it was as bright after the encounter as it was before." As much as this comet has surprised everyone, no one is going out on a limb and predicting it will become visible with the naked eye. But who knows? The comet's discoverer, Austrailian amateur astronomer Terry Lovejoy was able to image the comet in the day time! " I am hopeful of a nice binocular comet low in the dawn around Christmas time," Lovejoy said on the Ice in Space website. Comet Lovejoy in the early morning hours of Dec. 20, 2011. "Southern hemisphere viewers can see it now early in the morning," Battams said via phone this morning. "It is going to become increasingly easy for them to see as it moves away from the Sun. I'm not sure it will increase in brightness anymore, as it has leveled off a little bit now. Odds are stacked in the favor of a nice nighttime show for southern viewers, and gradually it will fade away." Of course, Comet Lovejoy isn't the only comet that has survived a close encounter with the Sun; in fact, some comets have even brightened to naked eye visibility after surviving a scorching from the Sun. The "Great Comets" of 1843 and 1882, and Comet Ikeya-Seki of 1965 were all Kreutz sungrazers - like Comet Lovejoy - and they all became brilliant after their solar encounters, with extraordinarily long tails. Normally these comets don't survive and are completely obliterated by the Sun. But the few that do - only 2 or 3 a century - can be very bright. I had asked Battams on Friday - just after the comet emerged from behind the Sun - his thoughts on Comet Lovejoy and if it might follow the example of those previous surviving sungrazers. "All bets are off as far as I'm concerned," he wrote via email. "We thought this was a relatively small one - maybe a hundred or two meters in diameter. Clearly it can't be. I did not expect it to survive perihelion as anything more than a diffuse blob that would rapidly dissipate. Instead it is pretty much as bright as it was before, just with less of a tail now." 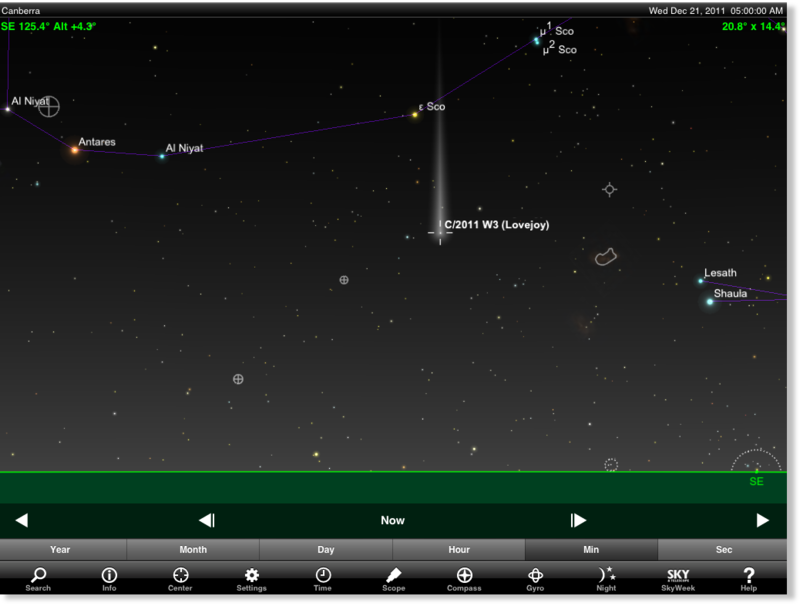 So keep a lookout for the holiday comet of 2011, the merry and bright Comet Lovejoy! © Colin Legg of Mandurah, Western Australia. Widespread reports of Comet Lovejoy's tail are being received from around the southern hemisphere. The ghostly plume emerges just before sunrise, jutting vertically upward into the eastern sky ahead of the sun. "I observed the comet with my unaided eye for 55 minutes this morning," says Colin Legg of Mandurah, Western Australia. 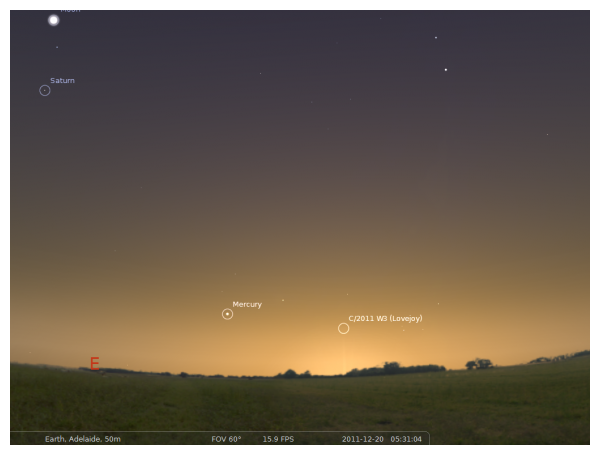 "I also captured a timelapse sequence of the comet rising as twilight progressed." Comet Lovejoy (2011 W3) rising over Western Australia from Colin Legg on Vimeo. "In the image you can see 2 tails," notes Clegg. These are the dust and ion tails. The gaseous ion tail is blow almost directly away from the sun by the solar wind, while the heavier, brighter dust tail more closely follows the comet's orbit. It's been one more day since Colin Legg posted his previous amazing photos and videos of Comet Legg. This new version is even better, especially with it reflecting off the water. Had another lovely view of the comet last night wandering the shore of the Estuary. It's quite unique down there. The Perth and Mandurah sky domes light up the northern half of the sky, while the east and south east are pitch black (except for a couple of small towns). The north glow is enough to walk by once dark adapted. Anyway, while wandering I came across a small embayment with still water and nice reflections of the comet. Used the same settings as last night to get the attached shot. Check out some of Colin's videos over on Vimeo. Images of space observations from the Hubble Space Telescope often leave me speechless. Pictures taken by amateur astronomers in their backyards also leave me speechless. Space, in general, has that effect -- peering deep into alien space-scapes, views that are very rarely experienced by our terrestrial existence, can be an incredible eye-opener. However, if you put an astronaut into space, with a camera, often those photographs have the most profound impact. Sometimes you just need a human to compose the best pictures. Take this beautiful view of the "sungrazing" Comet Lovejoy for example. NASA astronaut and Expedition 30 Commander Dan Burbank photographed the dazzling comet as it hung above the Earth's horizon yesterday (Dec. 21). The green haze is known as "airglow." Comet Lovejoy became quickly famous when it skimmed above the sun's surface last week, diving deep into the the corona. It was assumed the icy body would vaporize. This in itself is a great discovery -- it was the first time a sungrazer had been spotted by a ground observer before a space observatory. But against all the odds, NASA's Solar Dynamics Observatory spotted the tenacious comet zoom behind the sun after swinging through the solar atmosphere. It has since put on a wonderful cometary show for astronomers as it flies back into deep space. Fortunately, the show wasn't just for ground-based observers, it just so happened that Burbank had the best (off-world) seat in the house. Special thanks to Carolyn Porco, Cassini imaging science team leader, for directing me to this incredible photograph. Download hi-res version. A Russian space probe that failed in its attempt to reach one of Mars' moons will crash back to Earth next month, officials have said. 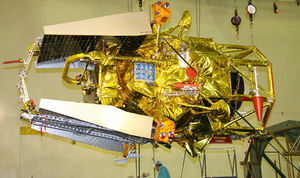 The unmanned Phobos-Grunt craft was successfully launched from the Baikonur cosmodrome in Kazakhstan in November. However, the probe got stuck in Earth's orbit after its engines failed to fire up - quickly ending its planned journey toward the Red Planet. Russia's space agency said it expects the Phobos-Grunt to plummet back through our atmosphere between January 6 and 19. Toxic fuel from the craft will burn on its fiery re-entry, but several dozen fragments weighing up to 200kg (440lbs) will crash into the Earth's surface, officials said. Where it will all land is not yet known however - with the agency explaining that the rough area where the probe's fragments will fall can only be calculated a few days ahead of its plunge. 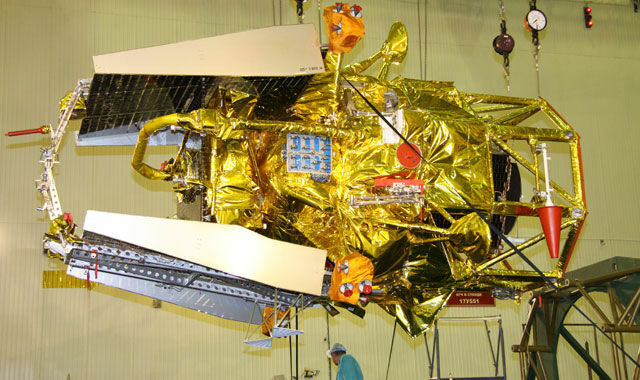 The embarrassing failure of the probe was the latest in a series of problems that have raised concerns about the condition of Russia's space industries. The £105m Phobos-Grunt would have been the country's first interplanetary mission since Soviet times. It was originally set to blast off in October 2009, but its launch was postponed because the craft was not ready. Scientists had hoped that studies of the moon's soil could help solve the mystery of its origin and shed more light on the genesis of the solar system. With thanks and gratitude for Suspicious0bservers's dedicated time and effort in producing this video. Comet Lovejoy (C/2011 W3) Esperance WA (27-12-2012) from Colin Legg on Vimeo. Colin Legg from Esperance, Australia has been documenting Comet Lovejoy's holiday gift to the southern hemisphere, and this is his latest - and possibly last - timelapse, as the comet has started to fade. 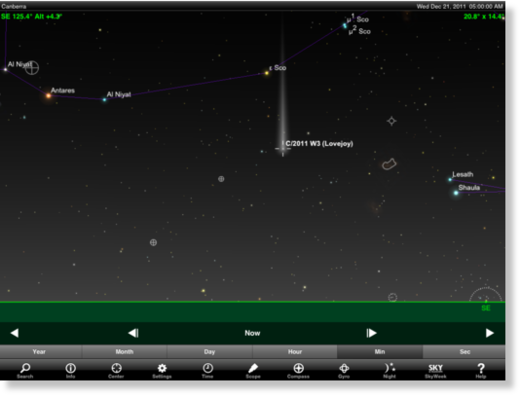 This one covers almost 5 hours of Legg's Comet Lovejoy views as seen during the early morning hours of December 27, 2011. "I used a tracking device to track in azimuth only to maximize coverage," Legg said. "If you look closely at the head in the 2nd half you can see it moving against the stars." Tucson, Arizona - A streaking green light across the Arizona sky Saturday night created a stir among KOLD News 13 viewers and Facebook friends. Around 8:15 p.m., viewers called to ask about the light, wondering if it were a meteor, an asteroid or fireworks. "I would guess it's a meteor, but that's only a guess without actually seeing it," said Stephen Pompea, public information officer for Kitt Peak Observatory. peak in the hours before dawn," Pompea said. "If you get up early, bundle up warmly, and find dark site with a wide-open view of the clear sky, you might see 1 or 2 meteors per minute during the shower's brief but intense performance." The light could be seen as far northwest as Prescott in Yavapai County and as far southeast as Douglas in Cochise County, according to News 13 Facebook friends. "Thought I was seeing things at first, it was amazing!" Suzanne Pickering wrote. Denise Goldman wrote: "My family and I were enjoying camp fire in Sahuarita. Meteor went from east to west. Very big ... and a beautiful green." This is a photo of the fireball that Maurizio Eltri captured from Lido, Venice, Italy on 27 December 2011 at 02:24. The fireball was very low in the east.